HiRISE acquired this now famous image of the Phoenix Lander during its descent through the atmosphere. The lander was still inside the backshell hanging from its parachute at the moment this image was taken. It was an engineering triumph to capture the lander within the HiRISE field of view. We had hoped for it to be within the color portion of the HiRISE camera, but unfortunately it missed that area. For this reason, processing the color bands did not take a high priority in the days following acquisition of this image. The unusual geometry of the image prevented the color processing from running through the automated software pipelines. It had to be processed “by hand” which means processing parameters were adjusting manually until good registration of the color bands was achieved. Normally, the 10 CCDs that span the HiRISE image area overlap by 48 pixels at their edges. The gaps in the image are due to the fact that Mars surface was moving through the HiRISE field of view at an angle, which also caused some image smear. (The slew was designed to get an unsmeared image of the parachute.) Some CCDs have gaps between them, while others overlap more than usual. Map projection takes the image and transforms it so it looks like you are looking straight down at the surface. The lander is very distorted in the map projection, because it is not actually on the surface. In the non-map projected image, the gaps have been closed to make a more aesthetic image. Some discontinuities are visible along the seams between CCDs where this has been done. The color does give some more information about the crater. There is frost or ice in the bowl of the crater which shows up as blue in the false color HiRISE data. Here the color has been adjusted for a more natural appearance. The frost is visible in the right side of the non-projected image. The Phoenix Lander discarded its heat shield after deploying the parachute. Scientists and engineers at JPL believe that the heat shield should also be visible in this image. After some analysis, the small dark dot located below the lander looks like a stong candidate for the heat shield. It is in the right location based on descent trajectories and timing. Another sign that the small dark spot is the heat shield is that its pixel value is lower than any other dark spot in the vicinity. 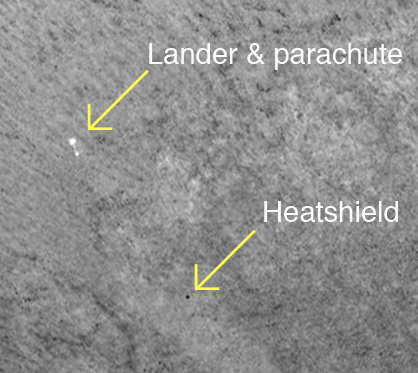 The lander is approximately 20 kilometers in front of the crater, so there is at least 20 kilometers less atmosphere between the HiRISE camera and the lander and heat shield than between the camera and the surface. The size is right, too. The heat shield protected the bottom of the lander through atmospheric entry, so its external surface would be a charred black. It is visible in the images taken of the actual landing site. For information about NASA and agency programs on the Web, visit: http://www.nasa.gov. NASA’s Jet Propulsion Laboratory, a division of the California Institute of Technology in Pasadena, Calif., manages the Mars Reconnaissance Orbiter for NASA's Science Mission Directorate, Washington. Lockheed Martin Space Systems is the prime contractor for the project and built the spacecraft. The HiRISE camera was built by Ball Aerospace and Technology Corporation and is operated by the University of Arizona. The image data were processed using the U.S. Geological Survey’s ISIS3 software.